Here is my contribution on name numerology. 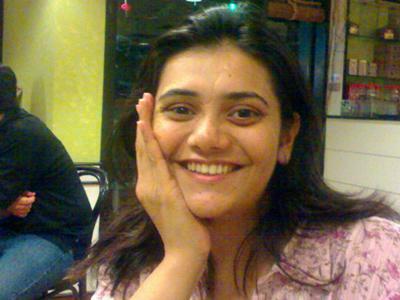 I am Disha Sanghvi from MUMBAI, age 25 yrs. My family shifted to A’bad in 1993. When I was 13 yrs old I was on a religious trip to Shrinathji with my family and we met with a major accident near Udaipur in which I lost my dad, younger brother, & grandma. I had multiple fractures in both lower limbs, hands, C2, C3, and many more. I was almost announced dead but God wanted me to live, and I came back to life in Rajasthan hospital. Since then I have been doing some or the other thing. I completed my graduation and than did my diploma in Corporate Communications & Advertising. I started working at an HR consulting firm and felt I was good with it. I got feeling I can do it well all alone as well that’s how CAZA was born and we are doing well now. I am proud I have at least started my 1st step in rearing my own baby. I feel good when people know CAZA when they come to me saying we would like to be partners with you for our recruitment process. Miles to go before I sleep. But knowing you through name numerology has been good and I wish we meet some day. My health is better now. It’s been 13 yrs that I have struggled to become normal but still I feel my test is not over. I got operated before some months and I am recovering,. I walk with a stick now and hope shall be all right. Any tips for me from name numerology? It is not necessary for me to know your date of birth to tell about you. Your name reveals all to me. Disha is in very bad vibration as per phonology. Di is a negative vibe like in Diana, Gandhi, etc. Sanghvi is in 24 and it may not vibe well with your day or life number in 3 causing problems. Yes. Your tests are not over. You have to urgently correct your name, so that in future you do not meet with such accidents or premature termination. You can overcome bad luck and achieve good luck only if you correct your name as per name numerology, astrology, and bioenergetics. Do this by visiting the contact page in this web site. Join in and write your own page! It's easy to do. How? Simply click here to return to Name Numerology For No. 8. Copyright © 2008-2018 by M. Sathiamurthi aka Kannan M & aka Sathiamurthi Muthuswami. All Rights Reserved. Contents are my own personal findings based on my experience & research. Contents are given in good faith with out any warranty.